Teas are a powerhouse for your health, especially green tea and jasmine tea. Jasmine tea in particular is often the first tea I reach for on the shelf at my local health food store. Jasmine tea is highly recognized for its unique fragrant flavor and scent. You may be surprised that jasmine tea is not an herbal formula; it is actually any tea flavored with jasmine flowers. Green tea is considered one of the more popular jasmine tea varieties. Jasmine flowers can also be added to black, white, and oolong teas. There are many things to like about jasmine tea. First off, jasmine tea has quite the history. It was first produced in China about 1,000 years ago during the Song dynasty. The process of scenting tea leaves with jasmine flowers further developed during the Ming Dynasty. Although jasmine tea is also popular in Taiwan, China is by far considered the best producer of the tea. Why all the praise for jasmine tea? You see, there are several valuable jasmine tea health benefits that you get from the polyphenol compounds, or antioxidants, inside the jasmine tea leaves. The catechins are the most common antioxidants found in jasmine teas, especially in green tea. Black tea is known for its particularly high level of theaflavins. Jasmine tea is definitely a tea your skin will love. In fact, jasmine is often an ingredient found in various cosmetic and skin care products, including shampoos and conditioners. The essential oils of the jasmine flower contain potent antiviral, antibacterial, and antiseptic properties. These effective health abilities are due to its many compounds such as benzyl benzoate, benzoic acid, and benzaldehyde. Also, jasmine oil helps remove scars left from stretch marks, acne, eruptions, and skin wounds. The botanical extracts and essential oils in jasmine can also help moisturize, reduce dryness, and increase elasticity in the skin. The antibacterial activity in jasmine tea also helps protect the skin from damage. Luckily, jasmine green tea makes for a useful facial tonic. All you need is to steep one teaspoon of loose jasmine green tea or one tea bag of jasmine green tea in about eight ounces of hot water. It is a good idea to let the jasmine green tea cool to room temperature in the refrigerator. Once cooled, splash the tea decoction over your face. You can also wipe the tea on your skin with a saturated cotton ball. The health benefits of jasmine tea also extend to the heart. The tea can reduce low-density lipoprotein (LDL) cholesterol and total cholesterol. As a result, you can certainly reduce your risk of heart disease, heart attacks, and strokes. The cholesterol-lowering effect from jasmine tea extract is thought to come from the catechin compounds, epigallocatechin gallate (ECGC) and epicatechin gallate. The catechins found in jasmine tea will inhibit LDL–oxidation, which can prevent heart disease. 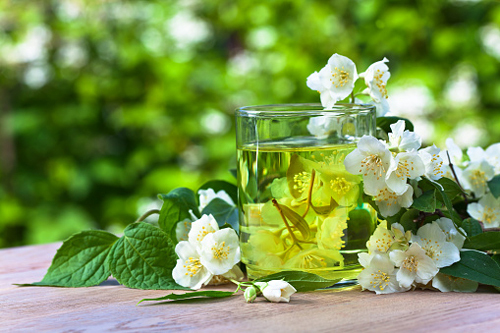 Jasmine can also calm a person’s mood, which will reduce high blood pressure during the process. In a 2004 study published in a Chinese journal, researchers concluded that drinking tea may play a role in stroke prevention. Higher tea consumption per month produced statistically better results against a decreased risk of stroke. The study included 13 groups of populations from 12 provinces in China. Each randomized sample in the study had about 1,000 people between the ages of 35 to 60-years-old. Jasmine tea is also a perfect complement to a weight loss regimen. The antioxidant catechins in jasmine tea can certainly support weight loss. The antioxidant properties in jasmine tea can also increase metabolism, and help the person get the most out of their exercise program. A 2009 study published in the International Journal of Obesity found that catechins in green tea have a positive effect with weight loss and weight management. People with sleep problems often have trouble falling asleep, or they may get up throughout the night. Jasmine tea or jasmine oil helps relax and calm the autonomic nervous system. As a result, people can enjoy a restful sleep. In a 2005 study published in the European Journal of Applied Physiology, researchers found that jasmine tea has a gentle sedative effect. For the study, participants exposed to the jasmine odor experienced a calmer mood and decreased heart rate. The soothing combination of green tea and jasmine tea can benefit those with stress. Just by the scent, jasmine tea is thought to be helpful in relieving anxiety, depression, tension, and headaches. The sedative effect of jasmine tea also helps to calm the mood for those in stressful situations. The polyphenol content in green tea (i.e. ECGC) is responsible for the protective abilities against cancer. Green tea can help prevent certain cancers, including esophageal, skin, stomach, pancreatic, prostate, lung, ovarian, colorectal, breast, and bladder cancers. Green tea can also inhibit potentially dangerous enzymes found in cancer cells and tumors. A 2009 study published in the journal Nutrition found a significant relationship between tea consumption and the risk development of esophageal squamous cell cancer. The people in the study who consumed the most unfermented teas such as oolong tea, green tea, and jasmine tea had a reduced risk of developing esophageal squamous cell cancer compared to those who did not consume any tea. Jasmine tea is also considered an effective remedy for reducing the development of diabetes. It is thought that drinking jasmine tea or green tea can reverse the negative effects of diabetes by lowering blood sugar levels and the formation of insulin. Studies suggest that green tea extract and a dietary supplement poly(L-glutamic acid) treatment may be a promising therapeutic and preventative tool for those with type 2 diabetes. Jasmine tea is considered a helpful remedy for digestion and the gastrointestinal system. Jasmine tea also helps balance gut bacteria in the body. Inflammatory bowel disease (IBD) is a term to describe chronic inflammatory disorders of the intestine, including ulcerative colitis and Crohn’s disease. In a 2011 study published in the journal Digestive Diseases and Sciences, researchers found that green tea extract with the IBD drug sulfasalazine showed greater effectiveness than just the drug treatment. Green tea and jasmine tea are considered important substances for mental awareness and alertness. The amino acid L-theanine found in green tea is also thought to provide mental alertness benefits for jasmine tea that helps enhance the thinking process. Jasmine tea and green tea are great preventative drinks to naturally boost the immune system. Jasmine green tea contains antibacterial and antiviral properties that help prevent respiratory illnesses such as the common cold or flu. A 2011 study published in the journal BMC Complementary & Alternative Medicine found that green tea catechins and theanine help prevent influenza infection. The study included 197 eligible healthcare workers. There were 98 participants allocated to receive the catechin and theanine capsules, and 99 would take the placebo. Jasmine tea is also an effective remedy for the reduction of chronic rheumatoid arthritis and joint pain. Jasmine also helps to reduce muscle aches and pains. A 2008 rat study published in the Journal of Nutrition suggested that green tea induces changes in arthritis-related immune responses. The epigallocatechin 3-gallate is responsible for the antirheumatic activity of jasmine tea. There are also other important benefits of jasmine tea. It can reduce allergies, improve energy levels, improve circulation, prevent tooth decay and bad breath, prevent liver disease, ulcers, and lower back pain. Jasmine is also considered an aphrodisiac or a sexual stimulant. For Optimal Benefits, How Much Jasmine Tea Should You Drink? Jasmine tea is great, but how much of it should you drink to obtain optimal health benefits? According to the University of Maryland Medical Center, adults will obtain between 240 milligrams (mg) and 320 mg of polyphenols when they consume two to three cups of jasmine tea or green tea each day. The two to three cup guideline allows you to receive the recommended health benefits without also getting too much caffeine in the diet. Although there are several health benefits of jasmine tea, there are also a few concerns to keep in mind. For starters, jasmine tea contains caffeine. It could cause sleeping problems when consumed in large amounts. The caffeine can also trigger diarrhea, vomiting, nausea, a reduced appetite, headaches, heart palpitations, dizziness, and irritability. As an alternative, it is a good idea to purchase caffeine-free jasmine tea to avoid high caffeine consumption in the diet. Jasmine tea or jasmine oil is not recommended for women during pregnancy. It is also thought that jasmine tea may cause intestinal pain. In northern China it is customary for people to serve jasmine tea to welcome guests. It is great to welcome people with the aromatic scent that represents jasmine tea. It also helps that the jasmine tea benefits are seemingly endless. Adding jasmine tea to your daily lifestyle could be just what the doctor ordered to complement a healthy lifestyle. Enjoy this delicious, green jasmine iced tea recipe! Billings-Smith, L., “Health Benefit of Jasmine Tea,” SFGATE.com, http://healthyeating.sfgate.com/health-benefit-jasmine-tea-10533.html, last accessed November 10, 2015. Turcotte, M., “Health Benefit of Jasmine Tea,” Livestrong.com, December 18, 2013; http://www.livestrong.com/article/23665-health-benefit-jasmine-tea/. Loux, R., “Ingredient Lab: Jasmine,” Women’s Health, September 13, 2012; http://www.womenshealthmag.com/style/ingredient-lab-jasmine. Hongratanaworakit, T., “Stimulating effect of aromatherapy massage with jasmine oil,” Natural Products Communications, 2010; 5(1): 157-162. “Health Benefits of Jasmine Tea,” Organic Facts web site; https://www.organicfacts.net/health-benefits/beverage/health-benefits-of-jasmine-tea.html, last accessed November 10, 2015. Kim, H.R., et al., “Green Tea Protects Rats against Autoimmune Arthritis by Modulating Disease-Related Immune Events,” The Journal of Nutrition, 2008; 138(11): 2111-2116; doi: 10.3945/jn.108.089912. Byrav, D.S., et al., “Comparative evaluation of different doses of green tea extract alone and in combination with sulfasalazine in experimentally induced inflammatory bowel disease in rats,” Digestive Diseases and Sciences, 2011; 56(5): 1369-1378, doi: 10.1007/s10620-010-1446-4. Kim, H.M., et al., “The Effects of Green Tea on Obesity and Type 2 Diabetes,” Diabetes & Metabolism Journal, 2013; 37(3): 173-175, doi: 10.4093/dmj.2013.37.3.173. Chen, Y.K., et al., “Food intake and the occurrence of squamous cell carcinoma in different sections of the esophagus in Taiwanese men,” Nutrition, 2009; 25(7-8): 753-761, doi: 10.1016/j.nut.2009.02.002. Hursel, R., et al., “The effects of green tea on weight loss and weight maintenance: a meta-analysis,” International Journal of Obesity, 2009, 33, 956-961; doi: 10.1038/ijo.2009.135. Chen, Z., et al., “[A study on the association between tea consumption and stroke],” Zhonghua Liu Xing Bing Xue Za Zhi, 2004; 25(8): 666-670. Kuroda, K., et al., “Sedative effects of the jasmine tea odor and (R)-(-)-linalool, one of its major odor components, on autonomic nerve activity and mood states,” European Journal of Applied Physiology, 2005; 95(2-3): 107-114. Matsumoto, K., et al., “Effects of Green Tea Catechins and Theanine on Preventing Influenza Infection among Healthcare Workers: A Randomized Controlled Trial,” BMC Complementary & Alternative Medicine, 2011; 11: 15; doi: 10.1186/1472-6882-11-15. “Green Jasmine-Mint Iced Tea with Lemon,” EatingWell web site, http://www.eatingwell.com/recipes/green_jasmine_mint_iced_tea_with_lemon.html, last accessed November 10, 2015.